Theresa May has accused the Labour Party of "turning a blind eye" towards anti-Semitism as she announced plans to help tackle hatred of Jewish people. The UK has adopted an international definition of anti-Semitism, which police, councils, universities and public bodies can use. Announcing the move, the PM said it was "disgusting" that anti-Semitic views were being found in British politics. Labour leader Jeremy Corbyn's spokesman said anti-Semitism was "repugnant". But Mrs May told a lunch of the Conservative Friends of Israel in London that the Conservatives were taking "the firmest stand" against anti-Semitism. The prime minister said that a clearer definition would "call out" anyone guilty of anti-Semitism in "essence, language or behaviour", saying it was "unacceptable that there is anti-Semitism in this country". "It is disgusting that these twisted views are being found in British politics," she said, adding: "Of course, I am talking mainly about the Labour Party and their hard-left allies." Labour, which has faced accusations that it has failed to tackle anti-Semitism in its own membership, said it welcomed the introduction of a new definition. Mr Corbyn's spokesman said the party believed "language or behaviour that displays hatred towards Jews is anti-Semitism, and is as repugnant and unacceptable as any other form of racism". On Tuesday, the government will publish its response to the Home Affairs Select Committee's calls for political leaders to do more to tackle the issue. Its Anti-Semitism in the UK Report criticised Mr Corbyn for a lack of "consistent leadership" on anti-Semitism but said that the majority of abuse was motivated by far-right parties rather than Labour. It deems anti-Semitism as a "certain perception of Jews, which may be expressed as hatred toward Jews". It adds: "Rhetorical and physical manifestations of anti-Semitism are directed toward Jewish or non-Jewish individuals and/or their property, toward Jewish community institutions and religious facilities." 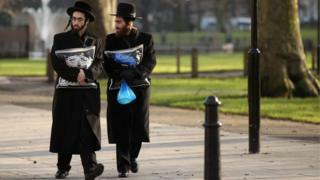 Downing Street said anti-Semitic behaviour could be overlooked because the term was ill-defined, with different organisations adopting their own interpretations. Police in the UK already use the IHRA definition. However, it can now also be used by other bodies, such as councils and universities, although it will not be legally binding. Universities UK, the umbrella body for the sector, confirmed it was looking at the plans, saying that existing definitions were "variable and sometimes contested". Sir Eric Pickles, the UK's envoy for post-Holocaust issues, told the BBC that the new definition addressed "modern" forms of anti-Semitism. He said that holding Jewish people "accountable for what's happening in Israel" was one example. "We've moved into a new phase of anti-Semitism, and it's important that definitions keep up," he said. Ephraim Mirvis, the chief rabbi of the UK and Commonwealth, welcomed the move for tackling what he called a "scourge in our society". Image caption Rabbi Ephraim Mirvis: "I would like to salute the prime minister for her leadership"
"My hope is that the adoption of this definition will provide a clarity which will herald a far more effective discourse on the ways that we can highlight and challenge anti-Semitism wherever it is found," he added. The Community Security Trust said the number of anti-Semitic incidents in the UK increased by 11% between January and June - from 500 in the same period last year, to 557 this year. Last week, a man who subjected Labour MP Luciana Berger to an online campaign of anti-Semitic abuse was jailed for two years. Communities Secretary Sajid Javid said anti-Semitism must be understood for what it was - "an attack on the identity of people who live, contribute and are valued in our society". "There can be no excuses for anti-Semitism or any other form of racism or prejudice," he said.